the most boring "exclusive" ever. I was going to playfully throw you some shade for being snarky and cynical, but yeah everything about that looks dull. It's cool that our friends across the pond are getting their own exclusives at conventions, but I'm sorry to see this is one. 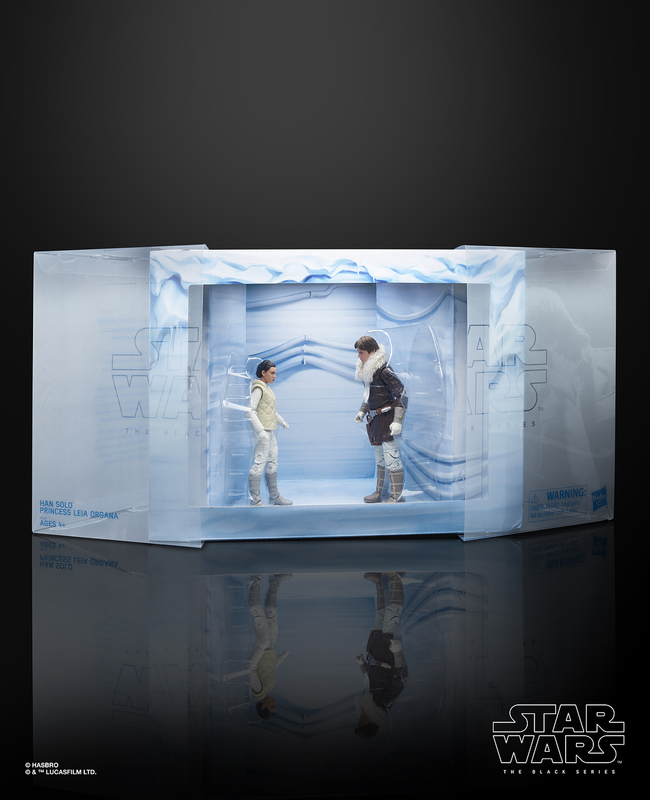 There is nothing dynamic about that box design, the diorama effect of the interior, the figure poses... Do either of the figures even come with any accessories? Exclusive for the sake of exclusive-ness? Should have been that scene with battered computer console when Leia is telling everyone to leave Hoth. Shoulda had her kissing a wookie with han having a WHHHAAATTT? Expression. At least that woulda had some amusement factor. Well considering the pictures of them opened show they BOTH have a few accessories, binoculars, pistols, goggles, blasters, im gonna say yes. They are probably housed inside the packaging. He is wearing it when he decides to go find Luke but Leia's not in that scene, he's talking to the deck officer or whoever the guy is. He only wears the jacket when outside or when in the hangar (except for during the escape) and he and Leia are never in the hangar at the same time except for when they're escaping. Leia: Han, please save Luke! Han: NO! Your mother was a crack whore pimped out by Bossk! People would've been mad about having to buy another Bespin Han to get an early-release Leia, this may never have happened in the movie but at least it's thematically linked, and provides the Blue vs Brown coat arguers their choice of coat color! She's not even an early release. Waiting longer for the exclusive when the retail has been out for a couple weeks. Is the retail version actually out yet? I know they went up for pre-order at the online stores recently but I haven't seen any of that wave at physical retail so far. I wasn't aware there was a debate and never really paid attention to Han's Hoth coat. There's a disagreement over whether it's blue or brown in the movie? It's not a huge debate, to my understanding at this point it's used as a joke about conflict more than an actual conflict. The lighting in the movie tends to make the jacket appear blue and the original Kenner toy gave him a blue coat but the actual jacket was brown and so the argument is whether the toys should depict it as blue or brown.